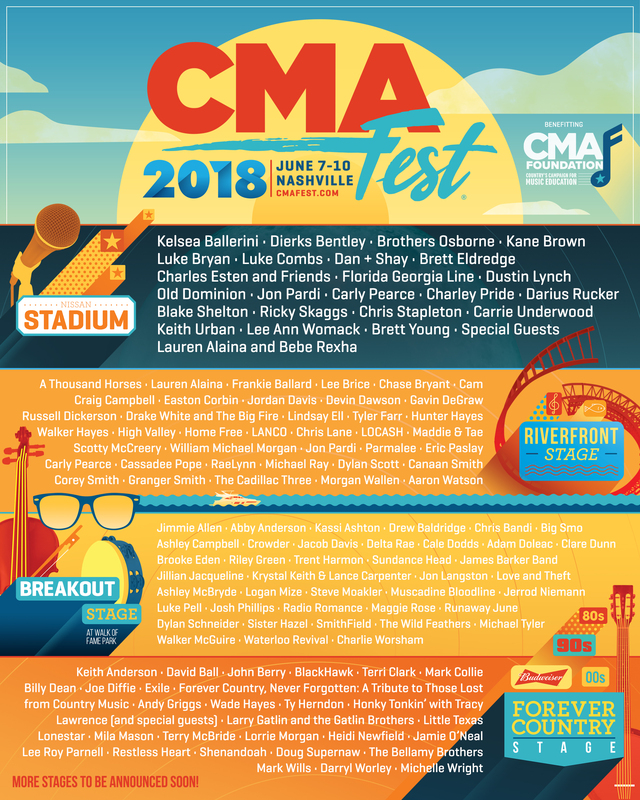 This year’s CMA Music Festival will celebrate their 47th year with hundreds of superstars in the industry, and showcase up-and-coming country artists throughout the four-day event. The festival is set to take place throughout downtown Nashville from Thursday June 7 through Sunday June 10. There will be 11 stages, including outdoor daytime stages that are free and open to the public. Proceeds from the festival will go toward the non-profit organization CMA Foundation, which strives to improve and sustain music education across the country. Stars like Keith Urban, Carrie Underwood, Lee Ann Womack, Black Shelton, Florida Georgia Line, and Chris Stapleton will perform throughout the fest at the nightly Nissan Stadium stage – shows are set to begin each night at 8 p.m. The CMA New Artist of the Year Jon Pardi will kick-off the show at the Chevy Riverfront Stage, opening at 10 a.m. each morning and running through 5:15 p.m. The lineup for this stage includes established artists like Gavin DeGraw, Hunter Hayes, Scotty McCreery, and Cassadee Pope. More up-and-coming artists can be found at the Chevy Breakout Stage, which will feature artists like Ashley McBryde, Sister Hazel, and Waterloo Revival. Budweiser’s Forever Country Stage, which will return for the second year, showcases some of country’s biggest stars throughout the years; Terri Clark, Andy Griggs, Little Texas, and Mark Wills can be found performing throughout the day. The Chevy Riverfront, Chevy Breakout, and Budweiser Forever Country stages will all be free and open to the public throughout the day. Last year’s festival hosted over 350 artists along with 1,100 musicians and drew sold-out crowds of 90,000 fans with visitors from all 50 states and even 20 international countries. CMA Fest holds the record for the longest-running country music festival in the world, with all of its funds going toward music educational programs across the U.S. Four-day passes and general admission day tickets are still available for the festival. For those that can’t attend, it will be filmed for a three-hour special segment on ABC. Check out the full lineup below and visit Ticket Club to grab your last-minute tickets and passes to this year’s CMA Festival.